Q: I just bought my Combi-Cam and the lock will not turn at all zeros. The lock will always come from the factory at all zeros. A common mistake when people go to test the lock is that they grab the combination head with one hand and the cam (arm in back) with the other. Since these two turn together when unlocked, of course the lock will not turn when holding on to both. Instead, grab the flat sides of the threaded cylinder between finger and thumb. Now turn the head. Q: Why can I not see the reset button to recombinate my lock? A. During installation or when taking it apart drawer lock, you rotated the inside cylinder. 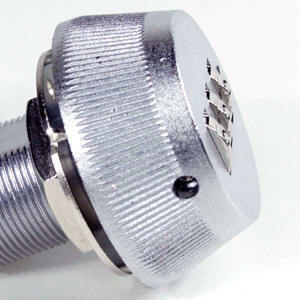 Remove the screw, lock washer, cam and stop cam. rotate the cylinder 180 degrees until you see the reset button and then reassemble. Q: I set my combination and am now locked out. A. See the two most common mistakes that happen and how to resolve. Q: What if I don't want Combi-Cam users to be able to change the combination? 1. Go ahead and set the desired combination to the Combi-Cam Drawer Lock. 2. Remove the Screw & Washer, the Cam, and the Stop Cam. 3. With the reset button in view, rotate the cylinder 180 degrees. 4. Replace the Screw & Washer, the Cam, and the Stop Cam. 5. Now when the cam rotates 90 degrees, the reset button is no longer accessible. 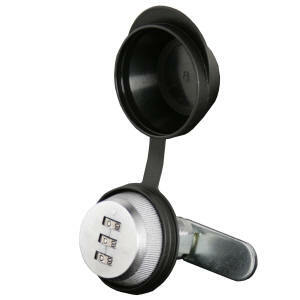 Q: What material thickness do these locks accommodate? 7850XL -with the 1-3/8" cylinder = material thickness up to 1-1/8"
7850L with the 1-1/8" cylinder = material thickness up to 7/8"
7850M with the 7/8" cylinder = material thickness up to 5/8"
7850S with the 5/8" cylinder = material thickness up to 3/8"
Q: How do I change the combination? A. Combi-Cam Drawer Lock had you, the consumer, in mind when we designed the recombination feature. The Combi-Cam combination is very easy to change and requires no special tools. 2. Use a paper clip to turn the push the reset button in and leave it pushed in while resetting the numbers. 3. After you have changed the numbers to your desired combination, let go of the button. 4. It is that easy! A. One of two things are happening. 1. You did not leave the reset button pushed in. 2. You did not start with the correct number that unlocks the cam. 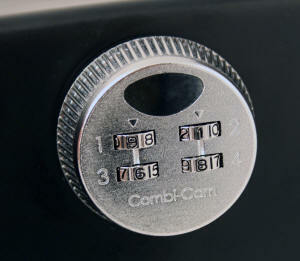 Before you can reset the combination, the number must be on the correct combination for the cam before resetting it. You may be able to push the reset button in but it will not change the combination. Q: What can I do if I forget my combination? Q: What is the warranty on the Combi-Cam? A: The Combi-Cam Drawer Lock has a one year warranty against manufacturing defects. This does not cover forgotten combinations. A common question is if we have a factory magic backdoor number, etc. that we can give to open a combination lock in the field. Would be nice if that was mechanically possible but it is not (and it would be on YouTube in seconds!). We have a machine that can read the combination of the dials. We will write the combination it was set to on a piece of paper for edification purposes and reset the lock back to the factory default of all zeros. There is no fee for this service.